Disclaimer: I am a David Platt fan. I think it is because I harbor such great respect for this man that I may come across as overtly harsh. This book is small, in almost all regards to the word. Small in size (7.9 x 5.1 x 0.5 inches), small in length (129 pages), and small in message. There was a lot of recycling going on, stories Platt has told verbatim in sermons, examples lifted from other books (one in particular about a missionary writing a letter to his prospective father in law, found in Don’t Waste Your Life by John Piper), and a lot of overlap from his first publication Radical. Speaking of Radical, he must have mentioned it over twenty times in this book, whether he was clarifying or re-emphasizing a point he made, or sharing feedback from readers on how his book reshaped their lives. 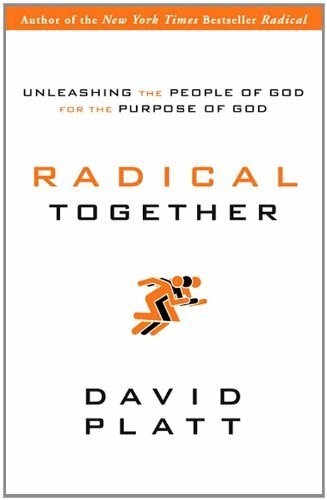 Even some of the endorsements in the front cover of Radical Together were actually about Radical! One example: Platt made a statement on facilities by begging the question, “why would we spend an inordinate amount of our resources on something that is never prescribed or even encouraged in the New Testament?” He proceeded to share a story about a church who stopped leasing out their building and met in a covered parking lot across the street so they could send the money they were spending overseas. As inspiring as that story is, it leaves me discouraged by how many questions I have: How do you meet outside in the winter time? Where do you do nursery? Where do you keep your chairs? For the duration of this read I found myself being frustrated with Platt. I respect his leadership and I want to follow him, but I don’t feel like he is practicing what he is preaching (to the extent that it’s being preached); this isn’t a stab, it’s a plea. If anyone could lead their church to sell their facility (I understand that they would only likely get 10% of what the value of the building is) and use those resources on that which is explicitly promoted in the New Testament, it’s David Platt. The follow-up, if the Church at Brook Hills could successfully minister and reach out to their local community while reaching the ends of the earth with the Gospel of Jesus Christ without a building, then anyone can do it. We just need to see how! All in all, I would label this book a disappointing pass. It’s a regurgitation of his first book topped with anecdotes and stories from his sermons.